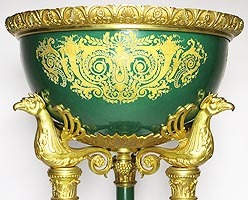 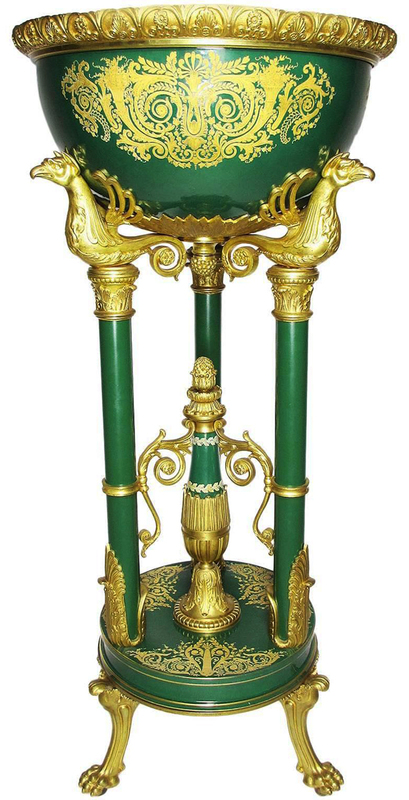 A Very Fine and Rare French 19th Century Napoleon III Gilt-Bronze-Mounted Porcelain and Enamel Standing Jardinière (planter) in the Egyptian Revival Style, probably by Sèvres, the circular green porcelain basin with relief gold decorations and cast foliate rim decorated with cornucopia within foliate scroll ornament, supported on turned enameled metal columns headed by mythical birds united by a center standard, on circular plinth and outswept feet ending in talons. 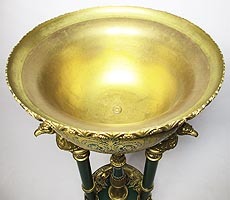 The base bears a pseudo "Caen French Porcelain" marking, Circa: 1870. 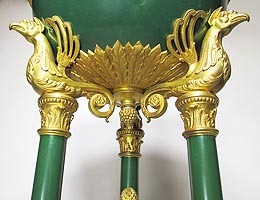 Caen was a porcelain factory located in Calvados, Normandy and was run by d’Aigmont-Desmares and Ducheval. 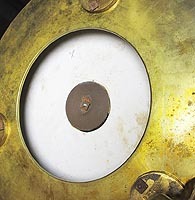 The factory was only active from 1793-1806 when it closed.